This is my ‘Five minute Friday’, inspired by the Gypsy Mama. The idea is that you write for five minutes flat on a topic, without worrying about whether it’s right or not. It’s kinda fun! Check out others’ interesting 5-minute posts on the topic here. This is my best five minutes (okay – I confess, it was 15 minutes this week…) on “Real”. 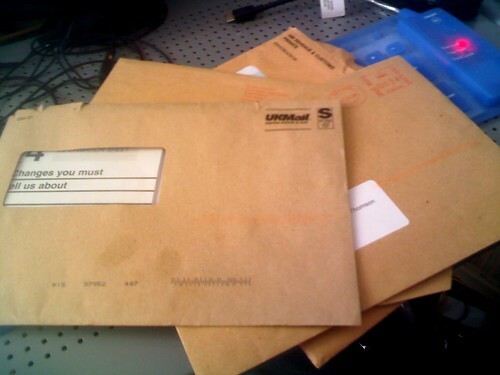 I stare at the brown envelope with a mixture of dread and nausea. It is an application for a renewal of my Blue Badge (disabled person’s parking badge). You get it automatically if you receive Higher Rate Mobility Disability Living Allowance, but my application for THAT benefit is in the post, and I have no real way of knowing whether I will get it this time. It is such a lottery, applying for disability benefit, especially when you have an ‘invisible’ and poorly-understood illness like M.E. (known as Chronic Fatigue Syndrome in the US). It is not that my disability has improved; in fact it has got considerably worse over the past 2 years. It is whether or not I will be believed. I fear the faceless anonymous person who will read my form. They have so much power over me. If I don’t get my Blue Badge there is no way that I will be able to go independently to a restaurant or doctors surgery. (I can’t do that at the moment, but hopefully if I improved slightly I would be able to walk the short distance if I could park right outside). I wanted to scream, ‘this isn’t my fault – this isn’t a lifestyle choice – this is so far from ‘what I want’ that I can’t begin to express it.’ As much as the illness, it was these questions and these attitudes that made me feel dis-abled – they took power away from me and I felt as though I was a liar who was begging to receive. A scrounger. A deceiver. It’s the ‘paradox of the nit nurse’ – you know, when the nurse comes to the school to look in your hair for nits. You don’t have nits, but from the second she comes in the classroom your head becomes inexplicably itchy and you scratch, guiltily, confusedly. This is real. I am genuine. But begging to be believed makes me feel like a faker. Prayers said for your application…hoping it gets approved without the further trauma of another tribunal. Your writing today has put my own small concerns into perspective. Much love across the ocean to you, new friend! Thank you so much for your support, Genevieve. Has been great connecting with you on your blog! Hope you have a good week. Oh for reasons more than being able to park right outside the door, I pray they see the real you. . .
And am so thankful we know He sees you and all your beauty. Someone close to me bares the same burden you do with this disease. Breaks my heart to see all that you both have to overcome… Hugs to you!